Electrocoagulation (EC) using Fe(0) electrodes is a potential arsenic removal technology for rural South Asia, where millions of people are exposed to toxic levels of geogenic arsenic in groundwater used as a source of drinking water. 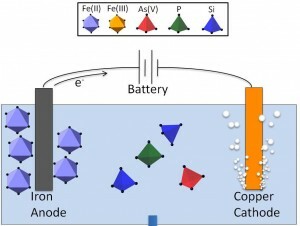 Electrocoagulation is a cheap and efficient technology that is based on applying an electric current to an Fe(0) anode in contact with pumped groundwater to promote the oxidative dissolution of Fe ions (Figure 1). The Fe ions rapidly polymerize in the presence of co-occurring ions, generating reactive Fe precipitates with a high affinity for binding arsenic. The performance of EC systems is strongly influenced by the presence of major inorganic groundwater ions (PO43-, SiO2, AsO43-, Ca2+, Mg2+), which alter the structure, reactivity and colloidal stability of EC precipitates. The aim of our project is to develop a molecular-level description of the Fe precipitates generated by EC as a function of solution chemistry. 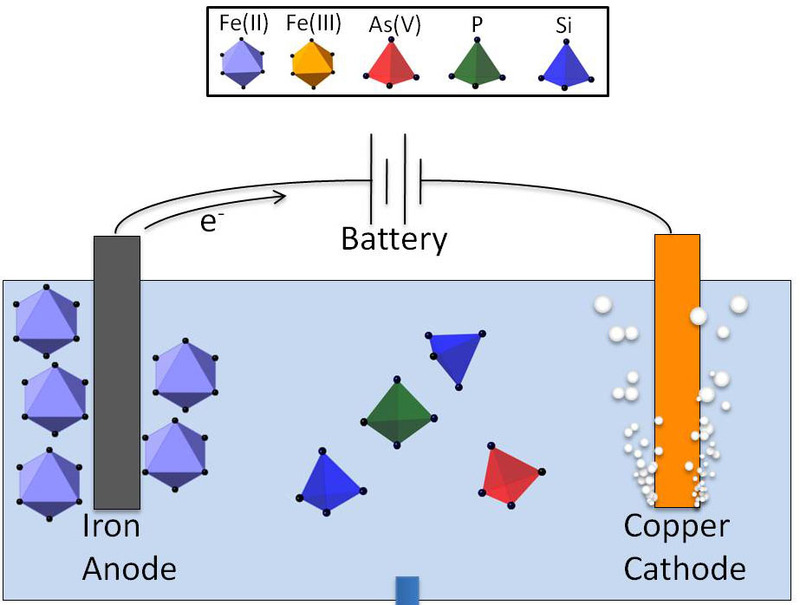 Understanding the interaction of Fe precipitates with co-occurring groundwater ions is critical to better predict EC performance and to make targeted improvements in EC system design. Currently, we are integrating the pair distribution function (PDF) analysis of high-energy scattering data with Fe, As, and Ca K-edge EXAFS spectra to create detailed descriptions of EC precipitate structures. By combining the complementary PDF and EXAFS techniques with batch uptake experiments and general chemical reasoning, we can obtain highly constrained structural representations of EC precipitates inaccessible with any single characterization technique (Figure 2). Figure 2. Structure of nanocrystalline hydrous ferric oxide with As(V) sorbed primarily in a binuclear corner sharing geometry determined from PDF analysis (top) and EXAFS spectroscopy (bottom). 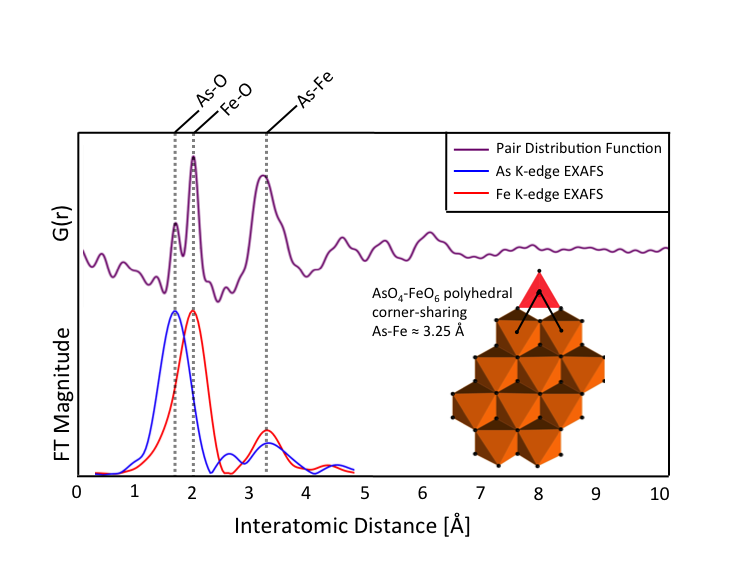 The dashed vertical lines highlight peaks due atomic pair correlations from As-O (AsO4 tetrahedra, 1.7 Å), Fe-O (FeO6 octahedron, 2.0 Å) and As-Fe (corner-sharing AsO4 and FeO6 polyhedra, 3.3 Å).